Hermanus-based Andrew Embleton’s third book on SA Air Force (SAAF) training looks set to be a winner with the military flying fraternity. “Wings over Langebaanweg. Stories from a South African Air Force Base” is a close to 350 page publication, lavishly illustrated with photographs supplied by many SAAF legends and stories harking back to the days Spitfires were a regular occurrence at the Western Cape coast base. Chapters include a brief history of the base; flying the Spitfire (contributed by co-author retired SAAF major general Des Barker); the Vampire, the SAAF’s first jet fighter and the Impala MB 326M. There are contributions aplenty from many who spent time on the base as pilots, instructors, armourers, officers commanding and more and these are all printed as they were related to the author adding to the authenticity of the publication. Among the myriad of quotes in the various anecdotes one stuck out in particular for this reviewer – and it wasn’t even from a pilot. Armourer Major Willie Burger, recalling some aspects of pupil pilot training, wrote: “A ‘pupe’ was – and still is – a complex being; a combination of schoolboy, know-it-all teenager, post-adolescent and often clumsy idiot who makes ore decisions on short finals than the Chief of the Air Force makes in a year”. That sums up the many parts of Embleton’s immacutely researched book. It has, apart from the contributions by Barker, others by men who were luminaries in the then SAAF. Names which spring to mind are those of former chiefs Willem Hechter, Denis Earp and Carlo Gagiano as well as Dave Knoesen, Pierre du Plessis, Piet Letley, Ray “Hobart” Houghton and a host of others. One of the otehrs was the legendary Chris Prins, the brains behind the first SAAF aerobatic team The Bumbling Bees which turned into the Silver Falcons. The current pilots are team 81 and they fly in the year marking the Falcons’ 50th anniversary. There are many references to the Falcons throughout the book. As the author notes in his “Final Reflections” piece, with thanks to Barker, initiator of the project and “vital to getting it all together”, “AFB Langebaanweg holds a unique place in the annals of our air force. “It has been the place where careers commenced and where professional skills were honed. Great pilots emerged over the years. From the outset we knew the story of Langebaanweg covered a huge canvas and that we could never hope to encompass it all in a short book of this nature. “It is essentially a scrapbook of memories laced with historical fact in a loose-knit collection. Pilots and other wrote it. We merely stitched it all together”. This reviewer has nothing but praise for the so-called “stitching job”. 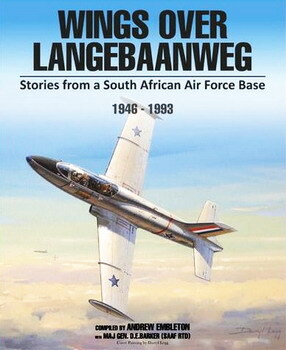 “Wings over Langebaanweg” is destined to become part of South Africa military aviation history and deservedly so. Here’s hoping Andrew will have to reprint a good few times!